The Labour leader, Harold Wilson, entered the 1964 campaign determined to end "13 wasted years" under the Tories. The populist Wilson seemed to reflect the public mood for change. The Conservative leader, Sir Alec Douglas-Home, was widely perceived as a distant, awkward aristocrat. Nevertheless, Wilson won only a tiny majority; another election seemed imminent. By the time of the 1964 general election, the Conservative Party had been in power for 13 years. Since Prime Minister Harold Macmillan's election victory in 1959, Conservative fortunes had plummeted. The buoyant economy that led to Macmillan's election was faltering by 1961. The following year, in a bid to restore his popularity, Macmillan sacked seven members of his cabinet in a move dubbed the "Night of the Long Knives". It was a ploy that failed. The Government ran into further problems when Britain's application to join the Common Market was rejected by the French President, Charles de Gaulle. Scandal added to the Government's woes when John Profumo, the Minister for War, was forced to resign after he admitted lying to Parliament over his involvement with the call girl, Christine Keeler. The Government looked tired, embattled and increasingly out of step with the public mood. In 1964, Macmillan, who had hoped to lead the Tories into the next election, resigned the premiership due to ill health. When the Conservatives chose the aristocratic Sir Alec Douglas-Home as their new leader, it was a gift for Labour. Harold Wilson had been elected Labour leader following the unexpected and untimely death of Hugh Gaitskell in 1962. A pragmatic politician, Wilson defeated George Brown for the party leadership and soon became a popular and charismatic leader. He contrasted favourably with Douglas-Home, who appeared removed both from the Britain inhabited by the majority of the British people and, to some extent, the modern world itself. As the two leaders began sparring with each other in the run up to the election, it became clear that Douglas-Home was simply unable to keep up with Wilson. Sir Alec had spent most of his political career in the House of Lords and was unused to the cut and thrust of political debate. Douglas-Home showed the depth of his inexperience when he remarked casually that he used matchsticks to help him understand economic problems. In contrast, Wilson was the academic high flyer. When Attlee brought him into the post-war cabinet, he was the youngest man to be appointed a minister since Pitt the Younger. When it came to problem-solving, Wilson was more familiar with slide rules than matchsticks. Despite Wilson's success as party leader, particularly in his skilful exploitation of the Profumo affair, Labour's lead in the opinion polls was slowly eroded as the election drew closer. The Tory revival was helped by Chancellor Reginald Maudling's "run for growth" pre-election Budget. With the two main parties running neck and neck as the election was called, the result hung on a knife edge. To promote the Tory manifesto, Prosperity with a Purpose, Sir Alec set off on a soap box tour of the country. His decision to appeal to the voters in person instead of concentrating on delivering his message via television was a mistake. Although Douglas-Home struggled with his television performances, he also had trouble dealing with hecklers. His attempts to silence them at rallies often made him look difficult and unsympathetic. The constant heckling Sir Alec experienced led him to accuse Labour of hiring hecklers to unsettle him deliberately. The Labour campaign was based around Harold Wilson, who was plugged as a man of the people. "If the past belongs to the Tories", Wilson declared, "the future belongs to us, all of us." Labour focussed on domestic issues, a weak point for Douglas-Home, a former Foreign Secretary. Economic planning, growth and scientific change were given prominence. New ministries for Wales, overseas development, technology and economic affairs were promised. The latter would provide a means for the Government to plan economic policy long term, leaving the day to day matters to the Treasury. Labour's manifesto was quickly ridiculed by Sir Alec as "a menu without prices". The Liberals' campaign theme, laid out in their manifesto, Think for Yourself - Vote Liberal, was a federal Britain in a federal Europe. 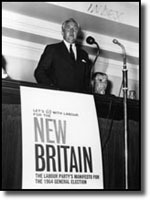 During the early 1960s the Liberals had experienced a surge of support as many voters grew tired of the Conservatives and were reluctant to turn to Labour. This election would see them field candidates in every constituency and campaign with real vigour for the first time since the general election of 1950. Towards the end of September, opinion polls showed the Tories ahead of the Opposition for the first time in three years. On 30 September, a Daily Mail poll showed the Conservatives enjoying a 2.9% lead. That day also saw the release of balance of payments figures showing a £73m deficit. Labour jumped on this economic crisis. Wilson blasted the Tories' economic policies as "stop-go" and although the Tories fought back, attacking Labour's spending commitments, their lead in the opinion polls began to fall away. The most attention-grabbing outburst of the campaign came from the Conservative Minister for Education and Science, Quintin Hogg. In a retort to one heckler who raised the Profumo scandal, Hogg declared: "If you can tell me there are no adulterers on the front bench of the Labour Party, you can talk to me about Profumo". Hogg's remarks caused a brief panic in Labour's campaign headquarters where it was feared that Wilson's relationship with his political secretary, Marcia Williams, might be misrepresented by the press. Lord Attlee, the former prime minister rebutted Hogg's remark and accused him of acting like "a schoolboy". Hogg later declared Labour voters were "stark, staring bonkers" and derided the Liberals as "insignificant and meaningless". Labour's only serious mistake of the campaign was made by Wilson himself. He suggested that the strikes occurring during the election were generated on behalf of the Tories to damage the Labour Party. He further implied an unofficial stoppage at the Hardy Spicer component firm was threatening the motor industry with closures. Wilson was spared from having to dig himself out of a hole by a libel writ issued by the company. This made the subject sub judice and therefore unprintable in the newspapers. On the day, Labour won by the narrowest of margins. Labour took 317 seats, giving them a majority of just four, the smallest since 1847. Although Labour enjoyed a 3.5% swing from the Conservatives, their share of the vote did not actually increase. However, the Tory turnout was two million down on 1959. The swing in the regions was somewhat uneven. Although the Tories held up in the Midlands, they saw the capital and the south-east move Labour's way. The Liberals did well in Scotland and doubled their vote for the second successive election, although they won just nine seats. Labour's victory was largely put down to the popular and populist leadership of Harold Wilson, which had done much to boost Labour morale in the run up to the election. Wilson rallied the Labour vote and benefited from the disillusionment of Conservative voters, many of whom stayed at home on polling day. Sir Alec's lack of charisma was blamed for the Tory defeat. Even so, after 13 years in power, winning a fourth term in office was always going to be a difficult task. The Conservative campaign was also criticised for not inspiring the faithful and for failing to take Labour to task over their policy commitments. The Chancellor, Reginald Maudling, was blamed for failing to cost Labour's policy proposals fast enough. When he released the frightening price tag of £900 million, it came too late to have any influence on the result. Labour was back in power for the first time since 1951, but only just. With a majority of four, Wilson would be unable to submit any major pieces of legislation to the House. A second election, held to enable Wilson to secure a mandate, was just around the corner.